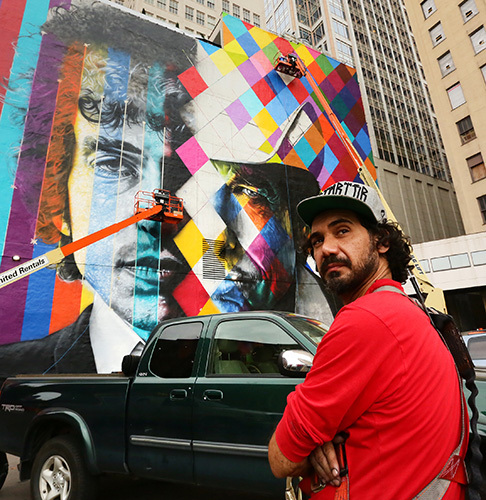 MINNEAPOLIS — Eduardo Kobra, an internationally acclaimed Brazilian muralist, will paint a five-story mural of Bob Dylan in downtown Minneapolis at the 15 Building located at Fifth Street and Hennepin Avenue. He begins work August 26, 2015. The mural will be painted on the west façade of the 15 Building, currently owned by R2 Companies and AIMS Real Estate, a business unit of Goldman Sachs Asset Management. The 15 Building is an historic Art Deco office tower constructed in the 1920s. More recently, it has become home to many creative loft-office users including Channel Z, Hunt Atkins, Bloom Health and Assemble™. The mural is a project of Hennepin Theatre Trust and adds to its growing portfolio of distinct projects that add art to unexpected – and often unadorned – spaces in the downtown Minneapolis Cultural District. Kobra’s murals of famous or historical figures are renowned and distinctive for their kaleidoscopic use of bright colors and bold lines. Kobra will be assisted by a team of five artists including three Brazilians and two Minnesota-based muralists / visual artists. Kobra's massively scaled portraits are a labor of love created with methodical grid planning. He typically works on buildings and walls using a mix of brushes, airbrushing and spray cans. He incorporates repeating squares and triangles in variegated backgrounds and intricate shading and swirling effects to achieve a sense of photorealism while maintaining playful color themes. His murals can be found throughout the world: from Brazil, Russia, Poland, Switzerland and Italy, to Los Angeles, New York and soon Minneapolis. Other notable figures he has captured in his work include Abraham Lincoln, the Presidents carved in Mount Rushmore, a ballerina poised as if for flight, inventor Alfred Nobel, activist Malala Yousafzai and pianist Arthur Rubenstein. Another popular Kobra mural is viewable from the High Line park in New York City and is based on the iconic Alfred Eisenstaedt photograph, “V-J Day in Times Square,” which captures a sailor kissing a woman in white. Kobra seeks to transform the urban landscape through art that captures elements of a city and blends memory and modernity. He often incorporates new technologies into his work and did the first 3D painting on the pavement of the Patriarca Plaza in central São Paulo, which looks different depending on the angle of the viewer. A community event will be held to celebrate completion of the mural. For information about the mural and other activities, visit HennepinTheatreTrust.org. Visit eduardokobra.com to learn more about Kobra and his art. HENNEPIN THEATRE TRUST, owner of the historic Orpheum, State, Pantages and New Century Theatres, is an independent, non-profit organization dedicated to arts-inspired community cultural development. We achieve our mission by presenting a rich mix of live performances, creating inspiring arts education experiences and advancing a thriving Cultural District in downtown Minneapolis, Minnesota. The Trust’s activities include presenting Broadway touring productions and the related Broadway Confidential series, concerts, comedy, speakers and other variety entertainment plus educational initiatives including our SpotLight Musical Theatre Program and Critical Review, Teen Ushers, the Access Program and Family Day on Hennepin. R2 Companies is a closely-held, fully integrated real estate investment and development firm based out of Chicago. R2 is an opportunistic firm that invests its own capital alongside a select group of institutional partners, making it an active and highly vested manager and operator. R2 currently owns and operates more than 2 million square feet of commercial real estate in Chicago and Minneapolis and is an experienced developer, having completed multi-family, mixed-use, retail and office projects. R2 is currently developing more than 1 million square feet of mixed-use developments in Chicago’s historic Goose Island neighborhood. Goldman Sachs Asset Management is the asset management arm of The Goldman Sachs Group, Inc. (NYSE: GS), which oversees $1.02 trillion in assets under supervision as of June 30, 2015. Goldman Sachs Asset Management has been providing discretionary investment advisory services since 1988 and has investment professionals in all major financial centers around the world. The company offers investment strategies across a broad range of asset classes to institutional and individual clients globally. Founded in 1869, Goldman Sachs is a leading global investment banking, securities and investment management firm that provides a wide range of financial services to a substantial and diversified client base that includes corporations, financial institutions, governments and high-net-worth individuals. 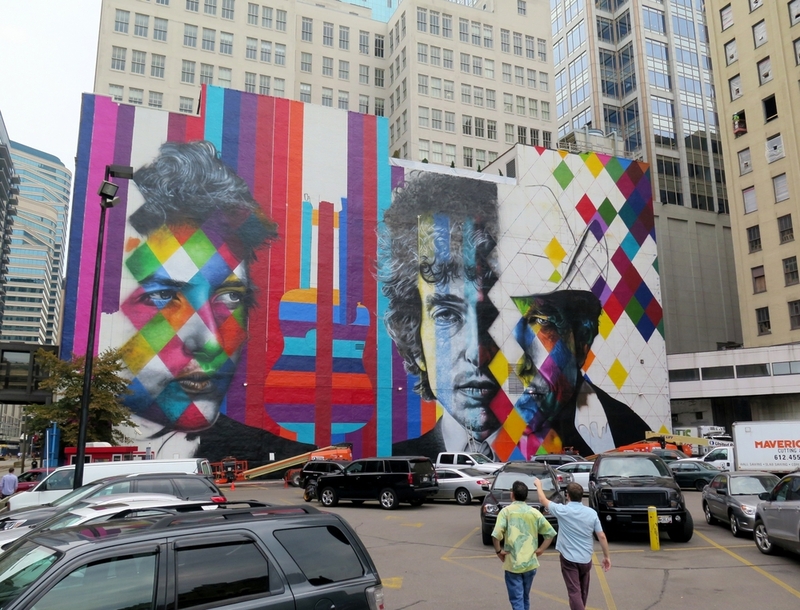 Eduardo Kobra, an internationally acclaimed Brazilian muralist, will paint a five-story mural of Bob Dylan in downtown Minneapolis at the 15 Building located at Fifth Street and Hennepin Avenue. He begins work August 26, 2015. Kobra’s murals of famous or historical figures are renowned and distinctive for their kaleidoscopic use of bright colors and bold lines. Kobra will be assisted by a team of five artists including three Brazilians and two Minnesota-based muralists / visual artists, Erin Sayer and Yuya Negishi. Kobra was born in the neighborhood of Campo Limpo, outskirts of São Paulo, and the design has always been a constant in his life. At age 12, already involved with older boys and connected to Hip Hop culture and “pixação”, a form of graffiti native to the Southeastern metropolises of São Paulo and Rio de Janeiro, in Brazil, he used to tag clandestinely walls from downtown in late 1980s. The contact with graffiti came five years later. Restless, he sought to improve his illustrations and began to have contact with the art of walls through books, besides meeting artists such as Diego Rivera and Candido Portinari, two of his great inspirations. Following the urban art developments in São Paulo in early 1990s, he created the Studio Kobra, converging to an original mural painting and taking advantage of his characteristics as an experimenter artist, and skilled realistic painter. Thus, he develops the project “Walls of Memory” which seeks to transform the urban landscape through art and redeem the memory of the city. This project is the synthesis of his peculiar way of creating, through which he paints but also adheres interferes and supersedes scenes and characters from the first decades of the twentieth century. It is an amalgamation of nostalgia and modernity, urging through scenographic paintings, sometimes monumental, from which he creates portals to wistful moments of the city. The largest of these murals, measuring 1000 m2 was carried out in 2009, at Avenida 23 de Maio in celebration of the anniversary of the city of São Paulo. Kobra develops his production with exhibitions in and outside Brazil, besides that he is always researching with different materials and new techniques, such as 3D (Kobra is the unique artist in Brazil that develops this technique), or anamorphic, pavement painting. At the invitation of the municipality of São Paulo, he made the first 3D pavement painting in Brazil. Kobra has also painted several murals in London, Athens, Lyon, Los Angeles and New York, where he painted his powerful reinterpretation of Alfred Eisenstein’s most famous picture. In the beginning of 2013, Kobra painted a huge mural of the Brazilian architect Oscar Niemeyer, covering the full side of an 18 story skyscraper at Avenida Paulista, in São Paulo, which has attracted worldwide attention and reverberated through several media outlets and art specialized media in different places around the world. The artist has traveled around the world spreading his style, and the list of cities with Kobra’s artworks has been increasing quickly, comprising cities as Moscow, Lexington, Los Angeles and also Miami, where he painted at the 2013 Miami Art Basel. Recently, Kobra painted a mural on the facade of MAAM Museum “Museo dell’Altro e Dell’Altrove”, which faces the historical Via Prenestina in Rome. On his latest trips, Kobra went to Japan, Dubai and Tahiti to paint local figures such as a classical Japanese woman from 19th Century; a Bedouin, as a fundamental character from United Arab Emirates; and two natives from French Polynesia. Before he went to Sweden where he painted the “Alfred Nobel” mural in the city of Boras. After finishing his work in Sweden, Kobra traveled to Poland at the invitation of Urban Forms Gallery, which has previously invited prominent artists like Inti, from Chile; Roa, from Belgium and the Brazilian brothers OsGemeos (The Twins). The “Rubinstein” painting is placed on a huge wall – 22 meters long by 22 meters tall. Right after that, Kobra went to France and the USA, where he painted his latest wall in New York. Currently, Kobra keeps his Studio at Vila Madalena, São Paulo and his development as an artist, and the recognition of his name as one of the great contemporary street artists has been growing more and more. Restless and relentless in his creative pursuits, Kobra is now a phenomenon of Brazilian new-vanguard art that “no longer” allows to be ignored. A team of artists is painting a kaleidoscopic portrait 60 feet tall and 150 feet wide. 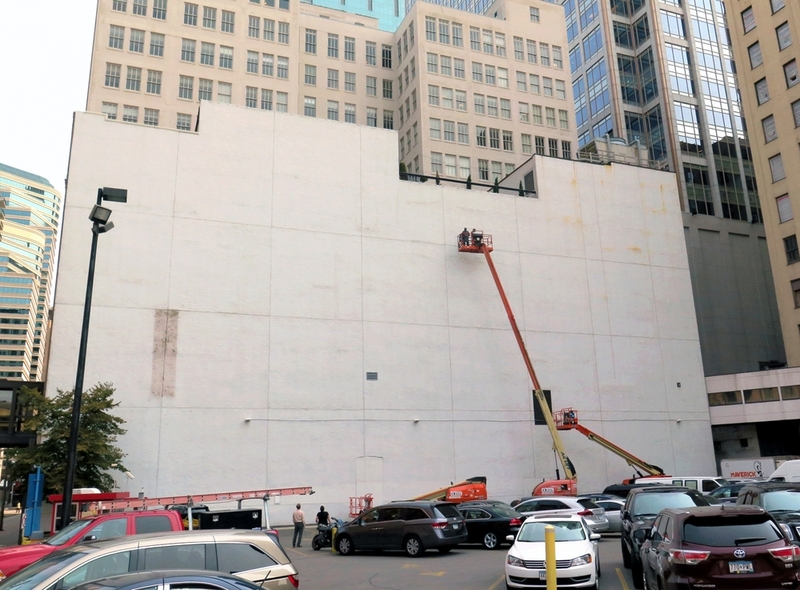 The blank white wall facing the corner of 5th and Hennepin Ave will become the 'canvas' for a mural by Brazillian artist Kobra- with an image of Bob Dylan. Photo taken 8/25 as work begins. The images begin to take form and the second day of work. Work in progress, day 3. The former blank white wall facing the corner of 5th and Hennepin Ave shot Sunday, August 30, 2015. The blank white wall facing the corner of 5th and Hennipen Ave shot Saturday August 29, 2015. The 'canvas' for a mural by Brazillian artist Kobra- with multiple images of Bob Dylan. The blank white wall facing the corner of 5th and Hennipen Av has become the 'canvas' for a mural by Brazillian artist Kobra- with multiple images of Bob Dylan. Photo taken Wednesday 09/02. The 'canvas' for a mural by Brazillian artist Kobra- with multiple images of Bob Dylan. The work has begun and will continue over the next two weeks as Brazilian artist Eduardo Kobra and his team of five artists -- three from Brazil and two from Minnesota -- attack the blank wall using boom lifts and air compressors to create a three-paneled image of musician Bob Dylan. The blank white wall facing the corner of 5th and Hennepin Ave shot Saturday August 29, 2015. The 'canvas' for a mural by Brazillian artist Kobra- with multiple images of Bob Dylan. The blank white wall becomes the 'canvas' for a mural by Brazillian artist Kobra- with multiple images of Bob Dylan. The 'canvas' for a mural by Brazillian artist Kobra- with multiple images of Bob Dylan takes on color, Friday 8/28. 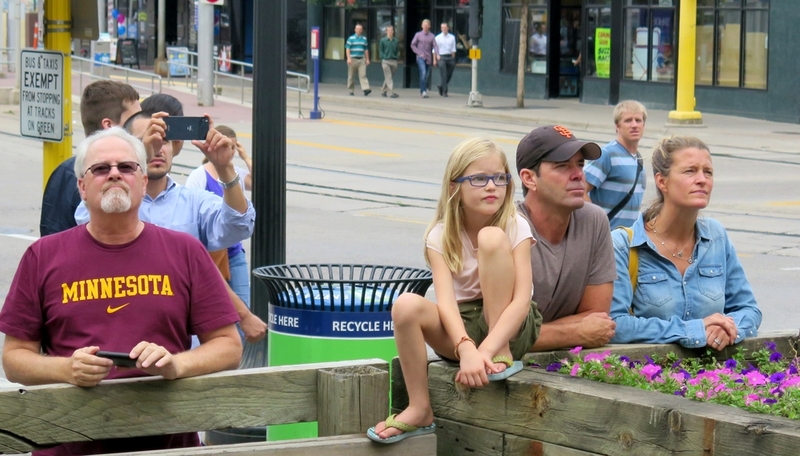 Spectators gathered on the corner of 5th and Hennepin to watch the process. Detail from the third of three Dylan faces early in the process. Detail from the third face, updated Sept. 02. Brazilian street artist Eduardo Kobra (left) and his three team members -- Silvio Cesar de Almeida, Marcos Rafael da Silva and Agnaldo Brito Pereira -- at the site of upcoming mural on Fifth Street and Hennepin Avenue. Brazillian artisit Kobra at work on a mural. The Bob Dylan mural nears completion, Friday, Sept. 04, as one of the artists steps back to check his work. The Bob Dylan mural nears completion, Friday, Sept. 04. The Bob Dylan mural nears completion, Friday, Sept. 04, as spectators stop at 5th and Hennepin to shoot photos. The Bob Dylan mural nears completion, Friday, Sept. 05. One of Minnesota’s most famous sons is going to gaze down on Hennepin Avenue from a five-story-high perch. Beginning Wednesday, a team of artists will begin painting a kaleidoscopic portrait of Bob Dylan that — at 60 feet tall and 150 feet wide — will fill the whitewashed wall of an Art Deco building at the southeast corner of Hennepin and S. 5th Street in downtown Minneapolis. The $50,000 project was commissioned by the building’s owner, Goldman Sachs, to help the city revitalize its downtown Cultural District. The work will unfold over the next two weeks as Brazilian artist Eduardo Kobra and his team of five artists — three from Brazil and two from Minnesota — attack the blank wall using boom lifts and air compressors. Kobra, whose portfolio stretches across three continents, was chosen for his vibrant style and international renown. He said Tuesday that he appreciates Dylan as an iconic figure with roots in Minnesota — and on Hennepin Avenue, where Dylan once owned the Orpheum Theatre. The blank white wall facing the corner of 5th Street and Hennepin Avenue will become the canvas for a mural by Brazillian artist Kobra with an image of Bob Dylan. “All of my work is based in memory, history and personalities that are important,” said Kobra. His past murals include a Miami work showing revered rappers Tupac and the Notorious B.I.G., a portrait of Nobel Peace laureate Malala Yousafzai that scales a wall in Rome, and an adaptation of the iconic V-J Day photograph, showing a Times Square kiss, that overlooks the High Line in New York City. Kobra wants the design to remain a surprise, but he invites anyone to watch the process unfold. He envisions a triptych of Dylan, with three pensive images in black and white mirroring the singer’s longevity. Two capture his younger years while a third shows a more seasoned Dylan brazenly wrinkled and wearing his iconic white hat. Twin Cities photographer Bill Hickey will document the process in a time-lapse video. Kobra, who got his start as a graffiti artist in São Paulo, has completed more than 10 U.S. projects, though this will be his largest outside of Brazil. Both the artist and his subject were chosen by Goldman Sachs, which co-owns the 15 Building at 15 S. 5th St. and operates it as a co-working space for small businesses. Goldman Sachs hired the Hennepin Theatre Trust to manage the project, which was launched in November. Vorderbruggen said the project managers considered other subjects, such as unsung heroes of social justice. They selected Dylan because of his widespread appeal, in the belief that accessibility is central to public art. The spectacle will give the commercialized corner a pop of culture, local artists hope, as well drawing admiration from afar for Kobra’s work. “I think it will add a level of interest and coolness and street cred to downtown,” said Erin Sayer, one of the two Minnesota artists on the project. She has seen Dylan live about 20 times and also has painted him. The other Minnesotan, Yuya Negishi, a native of Japan who moved to the Twin Cities in 2010, sees the project as an opportunity to celebrate world-class artists while also fostering homegrown talent. A famous Brazilian artist is creating a giant mural of Bob Dylan in downtown Minneapolis. MINNEAPOLIS (KMSP) - A team of artists have begun painting a 60-foot tall, 150-foot wide portrait of Minnesota-native Bob Dylan on a building in downtown Minneapolis. The $50,000 mural was commissioned by the building’s owner, Goldman Sachs, in coordination with Hennepin Theatre Trust. The five-story mural will cover a wall on the 15 Building, an historic Art Deco officer tower built in the 1920s which is located at Fifth Street and Hennepin Avenue. See more photos of the mural at http://www.fox9.com/news/12825343-gallery. “The mural is a project of Hennepin Theatre Trust and adds to its growing portfolio of distinct projects that add art to unexpected – and often unadorned – spaces in the downtown Minneapolis Cultural District,” Hennepin Theatre Trust stated. Well-known Brazilian muralist Eduardo Kobra began painting the mural on Wednesday. He's assisted by a team of five artists including three Brazilians and two Minnesota-based muralists. Kobra’s murals of famous or historical figures are known for their kaleidoscopic use of bright colors and bold lines. Kobra said they planned, studied, and mapped out the plan for 20 days before starting. It'll take them 15 days to finish the mural, working 12 hours each day. Singer-songwriter Bob Dylan was born in Duluth, Minn. in 1941 and raised in Hibbing on the Mesabi Range west of Lake Superior. He formed several bands while attending Hibbing High School and later enrolled at the University of Minnesota where he performed at local coffee shops and venues. He has since sold more than 100 million records, making him one of the best-selling artists of all time. “I bet people walked by this space all the time and thought nothing of it, and today they see it as an amazing work of art," Naomi Pesky, Hennepin Theatre Trust, said. MINNEAPOLIS -- A new piece of art is taking shape in downtown Minneapolis thanks to an internationally acclaimed muralist. Eduardo Kobra of Brazil is painting a five-story mural of Bob Dylan on the west facade of the 15 Building on Fifth Street and Hennepin Avenue. Kobra and a team of five artists--three from Brazil and two from Minneapolis--started the mural Wednesday. The 15 Building is owned by R2 Companies and AIMS Real Estate, a business unit of Goldman Sachs Asset Management. Commissioned by the building's owner, the mural is part of Hennepin Theatre Trust's effort to revitalize downtown Minneapolis with a Cultural District. "People are stopping, they're talking, they're having conversations in ways they've never had before and really seeing this space in a new way," said Naomi Pesky, vice president of external relations for Hennepin Theatre Trust. At twelve years old, Kobra got his start as a graffiti artist. He is known for his kaleidoscopic use of bright colors and bold lines. Kobra has completed more than 10 projects in the United States; the Bob Dylan mural is Kobra's largest work outside of Brazil. Through a translator, Kobra said, "My work is always related to the important personalities who are from the location where I choose to work and Bob Dylan is one of these." In a press release, Tom Hoch, president and CEO of Hennepin Theatre Trust said, "...it celebrates Bob Dylan who is not only one of Minnesota's most admired native sons, but also a former owner of the Trust's Orpheum Theatre." Dylan owned the Orpheum Theatre from 1979 to 1988 with his brother David Zimmeran. According to Pesky, the mural is part of a larger vision to bring more destination art to downtown Minneapolis. "The Cultural District runs from the Walker Art Center, which is on Hennepin Ave., all the way to the Mississippi River. Along the way, there are so many magical places where there's arts and culture in different and unique ways," Pesky said. Kobra and his team started work on the mural, which is 60 feet tall and 150 feet wide, on Wednesday. They are expected to finish the mural on Sept. 8. By now you’ve probably heard that downtown Minneapolis is getting a massive new piece of public art: a five-story mural of Minnesota’s own Bob Dylan by Brazilian muralist Eduardo Kobra. It will fill the west façade of the 15 Building at 15 South 5th St., just southeast of Hennepin Ave., visible across a parking lot from Hennepin all the way down 5th to Target Field. If you drive, walk, bus or bike downtown or use light rail, you can watch it take shape over the next two weeks. The 15 Building is owned by R2 Companies and AIMS Real Estate, a business unit of Goldman Sachs Asset Management. Vordebruggen considers this “one of the best moments of true partnership with the city … Mark Kuske called me, I flipped out and said ‘Yes!’ ”Mark Kuske at Goldman Sachs in New York reached out to Mary Altman, public arts administrator for the City of Minneapolis, who suggested he call Joan Vordebruggen, cultural district arts coordinator for Hennepin Theatre Trust and the mind behind “Made Here,” which has filled empty storefront windows along Hennepin Ave. with art since 2013. Hennepin Theatre Trust is now managing the project, meaning Vordebruggen is on site almost constantly, working with Kobra and his team of five artists. Three are from Brazil, two are from Minneapolis. The Brazilians speak only Portuguese, so Vordebruggen is using Google Translator. Kobra began as a young street artist in a low-income São Paulo neighborhood, tagging with an older graffiti crew. Today he is internationally known for his enormous works on buildings and walls, portraits that pulse with color. New York has a Kobra, a re-imagining of Eisenstaedt’s famous 1945 photograph “VJ Day in Times Square,” of a sailor kissing a young woman. Los Angeles has his psychedelic take on Mount Rushmore. For Art Basel in Miami, he painted rappers Tupac Shakur and the Notorious B.I.G. The city of Boras, Sweden, has Kobra’s Alfred Nobel mural; Lodz, Poland has Arthur Rubinstein. His gigantic portrait of the Russian ballerina Maya Plistetskaya leaps off a wall in Moscow. Dylan also has connections to Hennepin Avenue. He once owned the Orpheum Theatre, which today is owned by Hennepin Theatre Trust, and he played a sold-out, three-night stand there last November. Part of the parking lot of the 15 Building is now a work site, with ladders and boom lifts and air compressors. The formerly blank white wall is becoming a triptych of Dylan through the years. Lyrics from his song “The Times They Are A-Changin’ ” will be included in the final image. For Garrison, it’s about generating the kind of vibrancy that attracts companies and employees to R2's buildings. Public art and what it says about a city can be a strong draw. For Vordebruggen, it’s about vision. 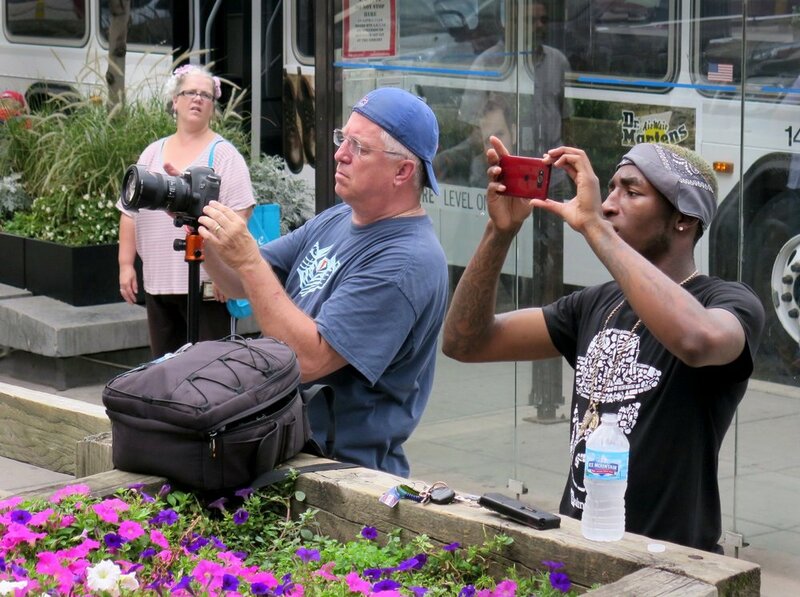 A photo crew was documenting the Dylan mural painting using time lapse photography and a low-flying drone in Minneapolis on August 30, 2015. A five-story tribute to Bob Dylan is rapidly taking shape in downtown Minneapolis, where world-renowned Brazilian artist Eduardo Kobra and five other painters are creating a huge multi-colored mural on the side of a building. Painting a mural 150 feet wide and 60 feet tall on the side of a building is a noisy business, what with the warning sirens going off every time the motorized lifts move. But Joan Vorderbruggen says everyone is just concentrating on painting the three huge images of Dylan at different stages in his career. The work is titled "Times are a-changing." Vorderbruggen, cultural district arts coordinator for the Hennepin Theatre Trust, is overseeing the project at 5th and Hennepin. She said she's had her eye on this wall as a potential site for a mural for some time, and she can hardly believe someone of Kobra's stature and his crew are now at work there. "It's just astonishing to see how fast they are able to work," she said. "Their reputation is that they are some of the best street artists in the entire world, and just watching them work is mesmerizing." Vorderbruggen explained Kobra's trademark style of combining photorealistic painting with kaleidoscopic color. Even after just a few days' work, the formerly white wall is a rainbow of reds, yellows and blues. Work on the mural is going quickly, although Kobra and his fellow painters say they are racing against time to get the piece finished by September 7. By the second day, August 27, 2015, the outline of the mural was clear, but Kobra said there was a huge amount of detail and color to be added. Three Brazilians came with Kobra to work on the mural, and when they come down from their perches to discuss their progress, the air fills with Portuguese. Speaking through an interpreter, Kobra said this is one of the most important walls his team has painted, because of its size and its subject. "In Brazil, Dylan is very respected," he said. "Especially for people who are more culturally informed." Kobra is much in demand. He began as a graffiti artist in Sao Paulo, but he has now completed murals around the world. He has projects scheduled for Haiti, Moscow, Brooklyn and Palm Beach, but pushed the Minneapolis mural to the front of the line. "It's a hard one," he said. "It's very big." Because of the scale of the work, the Brazilians enlisted the help of two Minnesotans, Erin Sayer and Yuya Negishi. Sayer, a veteran muralist, said Kobra is calm and really nice. Erin Sayer is one of two Minneapolis artists. "And can't speak a lick of English," she said, while stirring some paint. "But it doesn't matter, because when you are painting you understand the language of what you need to do." And as a fan who has attended 20 Dylan shows, Sayer is delighted to be part of a hometown homage to a favorite son. "This is our — I don't know — love letter to him, I guess," she said. As often happens with Dylan-related projects, things get vague when questions come up about his involvement. A family member who prefers to go unnamed has been involved. Organizers also don't want to reveal the cost of the project, but it's believed to be about $50,000. The building is owned by R2 Companies, a subsidiary of Goldman Sachs. R2 Vice President Matt Garrison said the aim is to make the building more attractive for creative companies. "It's about making the area interesting and vibrant," he said. "And hopefully other people do the same thing, and there is a multiplier effect, and this is how neighborhoods kind of change for the positive." By Sunday August 30, 2015, day five of painting, Kobra's trademark kaleidoscope style was beginning to emerge. The work is drawing a stream of visitors, including a woman who gave her name simply as Emiko. She said the mural could become a local icon. "Being a designer myself, I just love seeing art pop up like this all over the city," she said. "It just really represents the city in such a great way." Just about everyone involved in the project hopes the Dylan mural will become a visitor destination. And as it grows more colorful by the day, Kobra offered a hope for something else. He's heard it gets cold in Minneapolis. "So we are bringing some of the Brazilian heat to Minnesota," he said, laughing. The Kobra crew is working 13-hour days to get the piece finished. It's due to be complete Sept. 7. On the second day of painting, August 27, 2015, Eduardo Kobra roughed in details of the elder Dylan in the mural. Artists Marcos Rafael da Silva, Agnaldo Brito Pereira, Eduardo Kobra and Yuya Nigishi stepped back from painting to get a longer view of the piece on August 27, 2015. Minneapolis artist Yuya Nigishi stood precariously on a ladder to tape a line on the mural on August 27, 2015. Early in the work on the mural, an image of the young Bob Dylan took shape on the side of the 15 Building at 5th and Hennepin in downtown Minneapolis on August 27, 2015. The artist's name -- Kobra -- appears as a hashtag. Marcos Rafael de Silva and Eduardo Kobra looked over the plan for the mural on August 30, 2015. Eduardo Kobra is in town, and he is making a kaleidoscopic 'splash' off 5th and Hennepin! Kobra's in-the-works mural has garnered national, and international coverage daily, and the progress of the mural itself is impressive. Made Here leader, Joan Vorderbruggen, is working as the overseer of this project, and is using all of her energy and enthusiasm to keep everything running! This mural is a beautiful transformation in the downtown Minneapolis Cultural District, and will undoubtedly be a destination for tourists and locals alike. In the office adjacent to the wall, an employee noted, "We will be able to use the wall as a visual marker when giving people directions! Instead of 'turning left at the white wall', it'll be, 'turn left at the MAGNIFICENT BOB DYLAN MURAL!' 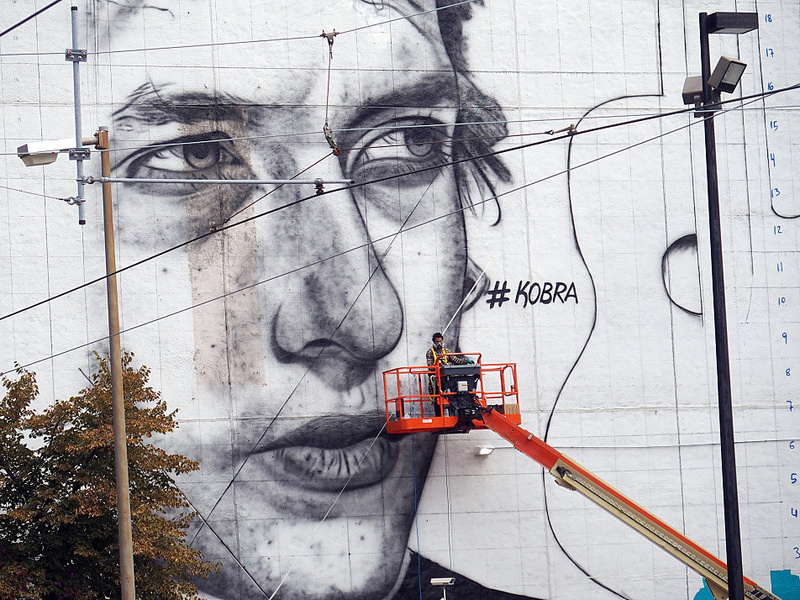 "
Keep track of all things 'Kobra-mural' by using the hashtag #KOBRAxDYLAN, as well as following the @MadeHereMN Instragram, Twitter, and Facebook feeds! Honestly, news about the project is everywhere... you can't miss it! "A five-story tribute to Bob Dylan is rapidly taking shape in downtown Minneapolis, where world-renowned Brazilian artist Eduardo Kobra and five other painters are creating a huge multi-colored mural on the side of a building." "The mural was commissioned by the building's owner, Goldman Sachs, in an effort to help Minneapolis revitalize the area." Eduardo Kobra and a copy of Dylan's autobiography, which serendipitously was found in the building that he's painting. Minneapolis is gaga for the work of Kobra, a Brazilian artist who has set up shop on Hennepin Avenue and Fifth Street, making a ginormous mural that so far features three motley-patterned visages of Bob Dylan’s face at various stages of his career. The in-process piece has taken social media by storm, with people sharing their opinions on Dylan’s place in Twin Cities history and snapping selfies in front of what has instantly become an iconic Minneapolis spot. We stopped by to check in on how Eduardo Kobra and his team of Brazilian artists (plus local artists Erin Sayer and Yuya Negishi) are holding up. Kobra doesn’t speak much English, but we chatted with him with the help of Hennepin Theater Trust’s communications director Karen Nelson, who happens to speak Portuguese. HTT is overseeing the project, which is being commissioned by the building owners, who are a business unit of Goldman Sachs Asset Management. Kobra features Dylan's guitar, indicating the historical moment when the musician ditched acoustic for electric. Can you say something about the process of creating this work, how you researched Bob Dylan and the history of Minneapolis? Kobra: I didn’t decide anything while I was here. All the planning I did in advance in my studio, in Brazil. The idea is a timeline, showing different phases of Bob Dylan. Were you very familiar with Bob Dylan before you started working on this project? Yes, Bob Dylan’s very well known in Brazil, many artists have been inspired by him. There’s a Brazilian artist named Raul Seixas. He’s a singer who was inspired a lot by Bob Dylan’s work, and through this artist Dylan became very well known in Brazil. How does Dylan’s music speak to you personally? The mural also has the title of one of his songs: “The Times They are a Changin’.” Personally, I like Dylan more in his earlier phase with the harmonica and the guitar. Can you say something about your time here in the Twin Cities. What do you think of Minneapolis so far? I haven’t had a lot of chances [to experience the city]. We’ve been working 12 hours a day. We ate lunch at Rosa Mexicana, and we went to the State Fair. We went on rides and ate hot dogs. I worked at an amusement park for 12 years. I was a painter there. Why do you think public art is so important in our society? I started painting when I was 12, in the streets. I’ve painted murals for 14 years. I went to prison when I was young for graffiti, so times have changed. Now a city can be supportive of artists like that. I want art that can be shared in the street so people can see it. I see the mural as a present to the city. Guest correspondent, Jill Emmer, paid two visits last week to this stunning mural to photograph the work in progress here in Minneapolis. São Paulo artist, Eduardo Kobra, has covered walls across the world with his amazingly detailed and colorful murals. He and his Brazilian crew - along with two Minneapolis artists - are now taking on one of their biggest projects yet: a 15,000 square foot (1.400 square meters) triptych of one Minnesota’s most beloved native sons: Bob Dylan. 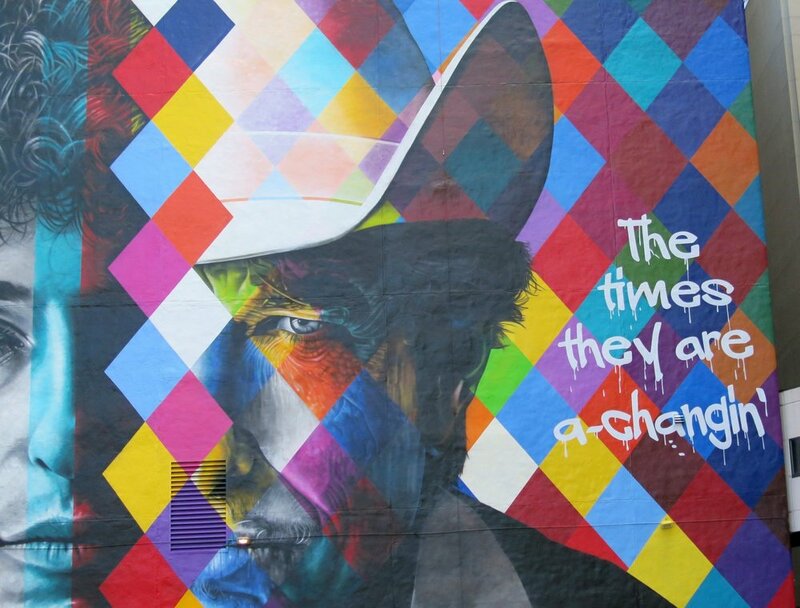 I first visited Eduardo Kobra’s mural of the changing faces of Bob Dylan over the years - aptly named “Times Are A-Changin” - only 3 days into the 2-week process it was already a jaw-dropper! The first thing that strikes you is the sheer size of it all. It is immense; covering the entire length of a downtown Minneapolis office building. You are then drawn in by the amazing level of detail in the portraits and the whimsical color patterns. It is at once both highly realistic and beautifully abstract. Because of the size of the work, Kobra and his crew brought on two Minneapolis artists to help: Erin Sayer and Yuya Negishi. Erin happens to be a close friend of mine and she shared with me some thoughts on her involvement. ES: "This is such an honor for me to work on. Not only because of Kobra’s reputation worldwide, but because I am a huge Bob Dylan fan! In a way, I think of this as my gift back to him for all the years of good music he’s given me." Minneapolis muralist, Erin Sayer, working on the upper reaches of the mural. ES: "Despite our language differences, Kobra and his crew have been amazing to work with. He is very calm and hardworking." On both of my visits, there were crowds gathered around to watch the progress. Minneapolis social media feeds are abuzz with photos of it. This mural — commissioned by the building’s owner (a subsidiary of Goldman Sachs) with the hope of attracting creative companies to work in the space — isn’t even complete yet and it’s bringing the community together and building excitement about a neglected corner of downtown Minneapolis. And that, in my mind, is what public art is all about. A member of Kobra’s Brazilian crew. Further reading: Gallery: Bob Dylan mural takes shape, updated Sept. 02, Star Tribune. The times, they are a-changin’ for the 15 Building in downtown Minneapolis. A permanent Bob Dylan mural catching eyes on the side of the 180,000-square-foot property, at 15 S. Fifth St. near Hennepin Avenue, complements a multimillion-dollar interior renovation. The effort so far has drawn a handful of new tenants enticed by a more open, modern feel. Chicago-based R2 and AIMS Real Estate, a Goldman Sachs Asset Management unit, bought the 15 Building a little more than a year ago. They planned a multimillion-dollar renovation for the nearly century-old building, which on a suite-by-suite basis will strip back to exposed brick and concrete and open up layouts to invite natural light. They’re out to create the kind of space — inside and out — that draws sought-after creative tenants, like marketing firms and ad agencies. Increasingly, mainstream companies are looking for the same thing, R2 Managing Principal Matt Garrison said. R2 and AIMS recruited Eduardo Kobra, a Brazilian street artist known around the globe, to cover up the blank east-facing wall with something that fit better with their vision for the art deco building. Kobra and his team started the 60-foot-high and 150-foot-wide project last week and expect to finish on Tuesday. Combined with the interior upgrades, Garrison expects the art to make the 15 Building, built in 1916, prime downtown real estate. On the outskirts of the skyway system, the property has easy access to the North Loop — one of the fastest-rising real estate markets in the nation, especially among creative-type tenants that generally fill loft-type office spaces like the ones sprouting up in the 15 Building revamp. The building was about half vacant when R2 and AIMS bought it. Since then, a handful of new leases increased occupancy to around 65 percent, Garrison said. Current tenants include media company Channel Z, ad firm Hunt Adkins, employee benefits startup Bloom Health and co-working space provider Assemble Shared Office. In addition, Garrison said several retailers are in talks to take over about 10,000 square feet of ground-level space, formerly home to a bar. The mural spotlights Dylan, the Minnesota-born singing legend, but it also showcases an opening for property owners and other downtown stakeholders to raise their profile — which can pay off in a big way, said Joan Vorderbruggen, who is helping manage the project as the arts coordinator for the Hennepin Theatre Trust‘s cultural district. Works like the mural draw people to downtown and keep visitors engaged with the space — as well as the businesses nearby, she said. Garrison said more privately financed efforts like the Dylan project would go a long way toward bolstering the arts and culture cachet of downtown, a potential boon for all property owners. Last Sunday I wrote about the mural that Eduardo Kobra and his team are painting in downtown Minneapolis. I say this often, but this time I really mean it: The photos don’t do it justice. What I found even more extraordinary than the painting itself, though, was the speed at which the artists were working. There was a clear “before-and-after” difference even in the half hour I spent on-site. I was eager a few days ago to stop by on my way home from work and see a full day’s progress. That’s how I met Joan Vordebruggen, cultural district arts coordinator for Hennepin Theatre Trust — and the project’s organizer. After a bit of chatting I mustered the courage to ask, “Do you think I might meet the artist?” She was gracious in her response. “He’s very focused,” she said. “Once he starts to work it’s hard to get him off the wall.” I understood completely. “But I’ll let you know if we have a media event tomorrow,” she offered. A few moments later a lanky man walked into the parking lot. I recognized him immediately from photos I’d seen online. He, too, was gracious — and patient about posing for a few photos. I wish I’d known a few more words of Portuguese to thank him for adding such a beautiful landmark to my city. What a privilege. The finished mural of Bob Dylan, Sept. 8, 2015. Eduardo Kobra looked up at his signature moments after adding it as a finishing touch to the mural on Sept. 8, 2015. With the mural finished, the crew posed atop the arm of one of the three hydraulic lifts used during the painting. From left to right they are: Agnaldo Brito Pereira, Marcos Rafael da Silva, Silvio Cesar Goncalves de Almeida, Eduardo Kobra, Yuya Nigishi, and Erin Sayer. Nigishi and Sayer are both based in Minneapolis. The almost-completed mural, Sept. 5, 2015. Despite a language barrier with most passersby, Eduardo Kobra was happy to pose with visitors for photographs when he took a break from painting, Sept. 5, 2015. One of the final additions to the mural was the title painted on the right. For the past few weeks, a big, bright mural with (multiple Bob Dylans on it) has been going up in downtown Minneapolis on Hennepin Avenue and 5th Street South — it was completed today. A team of artists from Brazil, led by well-known painter Eduardo Kobra, have been working on a colorful tribute to the legendary Minnesota-born artist. They also enlisted two local muralists, Erin Sayer and Yuya Negishi, to help transform the side of this five-story building into a work of art that is likely to become a local landmark. Photographer and Midwestival friend Jill Emmer (who you may know as @shineonyoucraydiamond on Instagram) happens to be pals with Erin Sayer and was invited to attend the signing of the mural earlier today. The occasion doubled as a send-off for the Brazilian artists as they headed out to the airport shortly after these photos were taken. Jill, who describes herself as a "mom with an iPhone," was thrilled to witness these historic moments alongside some of the Twin Cities' largest media outlets. She even got up the courage to ask the artists to pose for her before they parted ways. And she was kind enough to share some of her photos with us here. A time-lapse look at a five-story mural that adds a lot of color to the corner of a busy downtown Minneapolis intersection, thanks to Bob Dylan and Brazilian artist Eduardo Kobra.